The department of Organ Transplant at King George Medical University (KGMU) was established with the aim to benefit a large number of patients suffering from end stage organ failure in the state of Uttar Pradesh and beyond. The department started functioning in August 2013 with the recruitment of two transplant surgeons, two transplant coordinators and three ICU nurses. Transplantation is complex procedure and needs expert multidisciplinary team. Transplant team at KGMU includes highly trained and specialized doctors from various fields like Urology, Nephrology, Gastrosurgery, Hepatology, Intervention Radiology, Pathology, Microbiology, Blood bank, Anaesthesia, Critical care etc. King George Medical University had the largest trauma centre in the state of Uttar Pradesh and has the one of the highest incidence of brain dead patients in the country (Patients who had severe irreparable brain injury due to mostly trauma or stroke). One brain dead patient, by donation of various organs can give a new life to more than ten patients. This huge potential is being tapped by the department and has led to successful organ donations of liver, kidney and corneas with organs being delivered to needy patients in various hospitals in Uttar Pradesh and beyond, based on their wait list number. This drive is benefitting those patients who are unable to find a suitable living donor in their own family. A state of art transplantation unit is established in Centenary Hospital- Phase1. Department performed the first successful liver transplant of UP state medical colleges in collaboration with department of GI Surgery. Patients with Liver disease can get enrolled in Liver transplant waiting list at our institute. Living donor liver transplant is also an option for those who have a blood group compatible blood relative or spouse as organ donor. 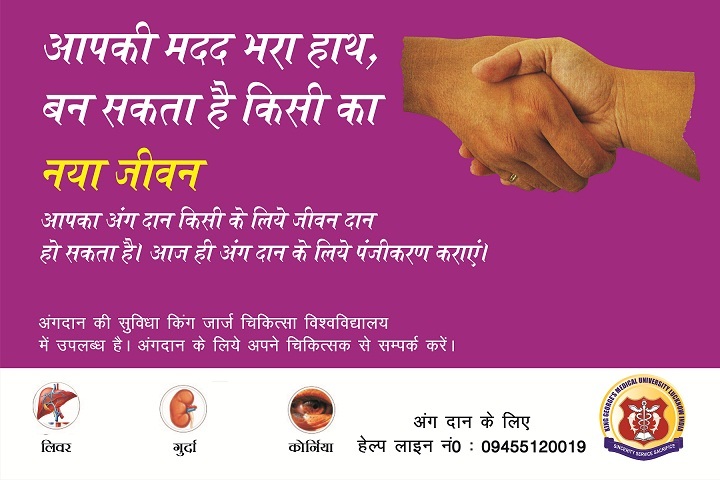 Patients can contact our department or OPD (Monday, Wednesday, Friday) to get registered for Liver transplantation.Besides liver transplant department also offers advanced surgical options for patients suffering with liver, biliary and pancreatic cancers. King George Medical University is also keen to develop pancreas and intestinal transplant with collaboration with department of Surgical Gastroenterology in the future.